This is the instruction manual for how to use our Digital Tattoo Stencil system. What is a Digital Tattoo Stencilsm? Instead of mailing out pieces of paper, Aramaic Designs offers tattoo stencils that are delivered through our website which allow our customers to lay their design out themselves using modern web technology. This means that once a translation is complete, you’ll have instant access to your stencil, conserve the fuel that would have been used to ship it, and have full control over how it comes out. In order for a Digital Tattoo Stencilsm to work, you will need to be running the latest version ofSafari, Google Chrome, or Firefox. Aramaic Designs recommends these browsers over Internet Explorer because it they are more secure, support web standards, and are less prone to cause problems with your computer. You will also need a printer in order to actually print your stencil. Any printer that is compatible with your home computer will work. A ruler (currently only in inches) on the top and left sides. Your translation in the upper-left-hand corner. Script controls in the bottom-right-hand corner. Each block of text in the upper-right-hand corner you can move by simply clicking and dragging (e.g. place the mouse cursor over the image, hold down the left mouse button and move things around). To resize the image, first hold down the shift key, then click and drag the image. This will change the width and height. When you release the mouse button (either after moving or resizing) the program will automatically refresh the image to one of sufficient sharpness to print clearly. If you have ordered multiple scripts on your translation you can put them together in any combination you want on your stencil. Simple use the pulldown menu at the bottom right-hand-corner of the page to select which script you want, and then click on the block of text you wish to see it in. The program will automatically refresh the image with the appropriate script. However, you may need to resize the image as not all scripts take up the same dimensions properly and may look smushed or stretched. 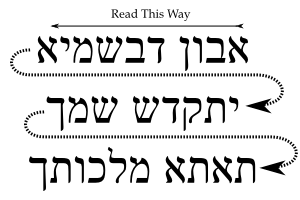 Aramaic is a language that reads in the opposite direction of English (that is from right to left rather than left to right). As such, when you lay out your stencil, you will need to keep this in mind. If you connect lines of text in the wrong direction, you will end up with a problem the likes of which happened to pop-star Ricky Martin and his Assyrian Aramaic tattoo. Because it is the customer’s sole responsibility for laying out their tattoo stencil to suit their needs, Aramaic Designs is not responsible for mistakes in the ordering of the text. However, if you’re worried, simply take a screenshot or picture of the printed stencil and send it in to us via email and we’ll be happy to double check it for you!